Description: The main stems of this species bear side branches in alternating series on opposite sides giving a feather-like colony. The colour of living specimens is a delicate light yellow-brown. 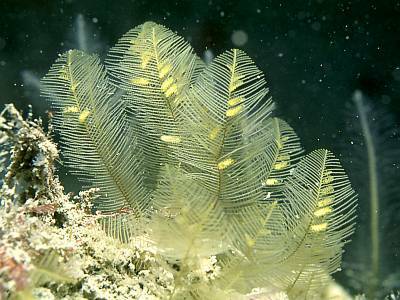 The feeding polyps are borne in a single series along the side branches, each surrounded by three defensive polyps. In all Aglaophenia species a few side branches are modified as reproductive structures called corbulae. Each upright stem of this species may bear from 3 to 7 of these corbulae when fertile. A specific feature is the basal leaf of the corbula which projects downwards in this species, rather than being curled round like the rest. Typically 5-7 cm in height by about 1 cm across the colony. Habitat: This is the commonest Aglaophenia species in water deeper than 10 metres, where it forms clumps on rocks and wrecks in moderate tidal streams and moderate levels of wave exposure. Ecology: A small nudibranch Doto lemchei feeds exclusively on this hydroid. It lives near the base of the colony but lays a short coil of eggs attached to the main stem. Distribution: A common species all round the British Isles on hard substrata. Similar Species: The other species of Aglaophenia are all similar. Gymnangium montagui is more robust and does not have corbulae. Picton, B.E. & Morrow, C.C. (2016). Aglaophenia tubulifera (Hincks, 1861). [In] Encyclopedia of Marine Life of Britain and Ireland.